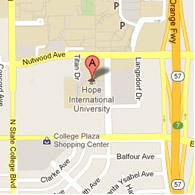 Want a look into our Hope campuses? View our image gallery. Consider HIU as the perfect venue for your next event. We offer a wide variety of facilities for rent to the community at very competitive rates, from small intimate classrooms to a large auditorium. We also have on-campus catering, ample parking, and convenient freeway access nearby. Complete and submit the request form (click below), or if you have any questions, contact our Events Coordinator, Christopher Mathaga, at (714) 879-3901 ext. 7474 or email EventRequest@hiu.edu.